"La rapidez del envío es genial. Un saludo"
Keychain with lucky charms. It is a nice keychain composed of spherical porcelain beads and four metal charms, elephant, Chinese coin, clover and fig. These four talismans are very popular, they are credited with the power to attract luck and fortune that are also amulets of protection. The total length of the lucky keychain is about 15 cm. Handmade pendant, butterfly model gold plated. Cute handmade butterfly shaped pendant from Brazil. The butterfly handmade pendant is composed of 4 sheets of delicate semi-precious tiger eye stones that form the butterfly wings. The pendant is a metal alloy plated with gold. 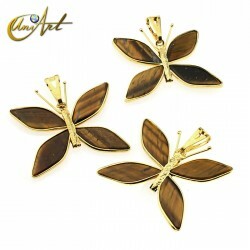 The butterfly pendant is between 3 cm to 4 cm and weighs about 3 grams. We offer you the largest selection of amulets for good luck within online selling in Spain. Choose your favorite pendant or charm to attract money or love. Our lucky charms are handmade with natural stones and a lot of magic. According to ancient wisdom, the lucky charms have their powers increased associated with energy minerals, so our amulets for bring luck are made with semiprecious stones. The meanings of these talismans of luck are based on the findings and researches conducted by our team and are presented in a holistic and respectful manner with all faiths and cultures. We invite you to see our wide variety of good luck charms.